John Dorish is a Greenwich Village based artist whose paintings and etchings reflect the drama and mood of the city around him. Born in Pittsburgh, PA in December 1947, John Dorish had no formal art training. He sold his first paintings while a student at Clarion State Teachers College, where he received his BA degree in Humanities in 1970. In 1977, he moved to New York where he established a studio on 13th street and began studying Printmaking at the Art Students League. “Best Innovative Work” at Philadelphia Watercolor Society Works on Paper exhibit in September 2015 for the hand painted etching: GREENWICH VILLAGE STUDIO II. “Sand Dollar Award” at the Virginia Beach Boardwalk Art Show in June 2016 for a 2-plate etching “MOONLIGHT WALK”. A watercolor Honor Society “Award of Excellence” in WATERCOLOR USA 2016, a national Aqua-media exhibition at Springfield Art Museum in Missouri, for a semi abstract painting COMPOSITION I. 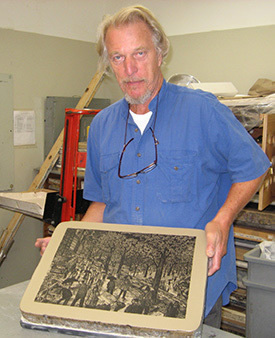 In New York John Dorish has exhibited with Allied Artists of America, the New York Print Club and the New York Society of Etchers. Other Group Exhibitions include “New York State of Mind” at the Flynn Gallery in Greenwich CT. The etching BLUE MOON was purchased by the New York Public Library for their Print collection. His work can also be seen on Cape Cod at the Harmon Gallery in Wellfleet, MA.